The Nashville Symphony’s recording of works by composer Stephen Paulus earned a GRAMMY® for Best Classical Compendium at the 58th annual awards ceremony, February 15th. Maestro Giancarlo Guerrero is conductor and Nathan Laube is organ soloist for the three movement Grand Concerto for organ and orchestra. Schoenstein president, Jack Bethards, credits American Guild of Organists programming for inspiring the recording, “Immediately after Nathan Laube’s electrifying performance of the Paulus at the 2012 National Convention, Maestro Guerrero decided that the work must be recorded and that Nathan must return. It is this caliber of playing that can make organists the equal of our great pianists and violinists in the minds of sophisticated concert audiences.” Employing hymn fragments, the Grand Concerto is a work of sweeping gestures and melodies as well as wide contrasts of mood and texture. 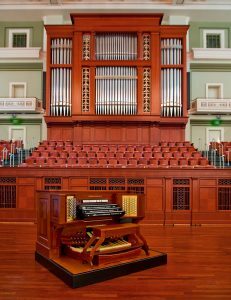 The organ heard on this World Premiere recording is the 47-stop, 64- rank Schoenstein built in 2007 for the Schermerhorn Symphony Center. The CD is NAXOS 8.559740.